What The U.S. Can Learn From Finland, Where School Starts At Age 7 Finland, a country the size of Minnesota, beats the U.S. in math, reading and science. The country's top education official says investing in preschool and day care is key. Finland, a country the size of Minnesota, beats the U.S. in math, reading and science, even though Finnish children don't start school until age 7. Krista Kiuru, Finland's minister of education and science who met with education officials in Washington recently, chalks success up to what she calls the "Finnish way." Every child in Finland under age 7 has the right to child care and preschool by law, regardless of family income. Over 97 percent of 3- to 6-year-olds attend a program of one type or another. But, says Kiuru, the key to Finland's universal preschool system is quality. "First of all, it's about having high-quality teachers," Kiuru says. "Day care teachers are having Bachelor degrees. So we trust our teachers, and that's very, very important. And the third factor: we have strong values in the political level." Author Amanda Ripley says she didn't really believe it, so she went to Finland and several other top-performing countries to see for herself. She wrote The Smartest Kids in the World: And How They Got That Way. Compared to Singapore, South Korea or Japan, she says, Finland's approach is pretty laid back, even though its standards — like what preschoolers should know and be able to do — are set by Finland's National Curriculum Guidelines for early childcare. 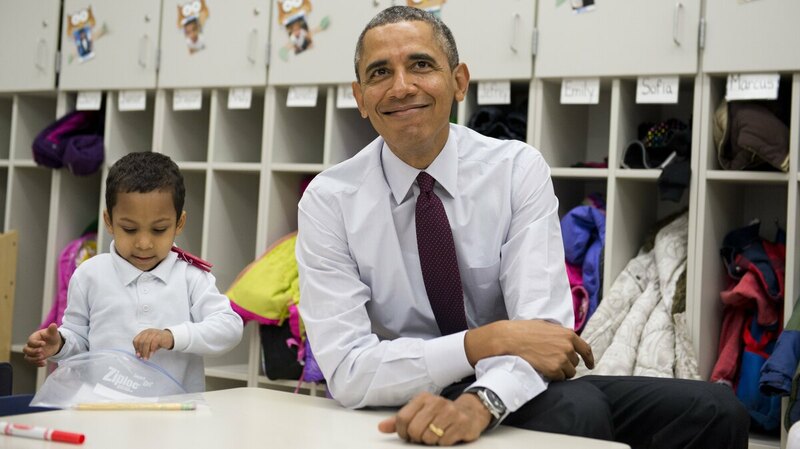 President Barack Obama sits with students during a tour of a Pre-K classroom at Powell Elementary School in Washington, D.C., this week. "Kids are almost all in some kind of day care, all of whom are working in the same curriculum that's aligned with what they're going to learn in school," she says. "That's a level of coherence that most U.S. kids will never experience because we don't have a coherent system with highly trained people in almost every classroom." It's a level of coherence that President Obama has repeatedly called for. Until there's a national consensus on standards and what quality preschool should look like, Ripley says early childhood education in the U.S. will remain fragmented. Then there's the money issue. In Finland, of course, preschool and day care are basically free, because people pay a lot more taxes to fund these programs. Another glaring difference is the child poverty rate, which is almost 25 percent in the U.S. — five times more than in Finland. "And in most countries I've traveled to, they see poverty and education as linked. You cannot separate them," Ripley says. "It's very clear from the research in the U.S. that our problems with inequality [and] school failure are set when children walk in the school door," says Steve Barnett, director of the National Institute for Early Education Research at Rutgers University. Sixty percent of the poorest 4-year-olds in the U.S. get no preschool. Most, says Barnett, start school 18 months behind. "Those kids are going to be in a spiral of failure, and we set that up by not adequately investing before they get to kindergarten," Barnett says. "We certainly can learn from countries like Finland." Kiuru says she's in no position to say why the U.S. is struggling so much with this issue, but if her country has a lesson to offer, it's this: "If you invest in early childhood education, in preschool and day care, that will lead [to] better results," Kiuru says. That, she says, is the "Finnish way."